ZVEZVDNY GORODOK /Moscow region/, December 24. /TASS/. The crew of the International Space Station (ISS) demonstrated perfect teamwork when dealing with the incident with a hole in the casing of the Soyuz MS-09 spacecraft, Russian cosmonaut Sergei Prokopyev, who returned from the ISS last week, told a news conference on Monday. "We pooled out efforts and acted as a single team while dealing with that emergency situation. Whatever may happen onboard the station, the crew is ready for anything," he stressed. On August 30, a drop in air pressure was registered on the ISS. 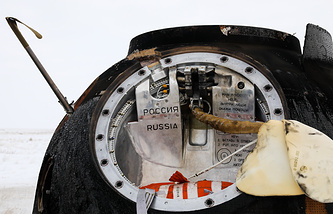 The crew examined the compartments and add-on modules one by one to identify a two-millimeter hole in the hull of the Soyuz MS-09 spacecraft attached to the orbital outpost. In the evening of the same day it was patched up with several layers of epoxy resin. Pressure returned to normal. On August 31, the crew reinforced the patch with another layer of sealant. Russian cosmonauts Oleg Kononenko, who continues his mission onboard the ISS, and Sergei Prokopyev made a spacewalk overnight to December 12 to inspect the hole in the Soyuz spacecraft’s casing. They unsealed the thermal insulation layer and the meteorite shield, inspected and photographed the hole and also scraped off samples from the hole’s surface.